World Mental Health Day, on the 10th of October, aims to raise awareness of mental health issues around the world and to mobilise efforts in support of mental health. This year’s theme is ‘young people and mental health in a changing world’. 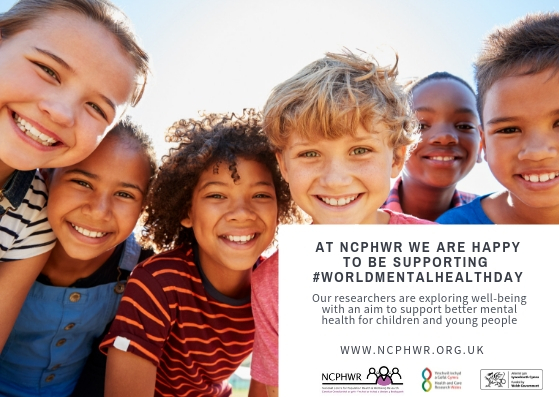 Prevention begins with better understanding and this day provides an opportunity for us to highlight our current work and findings around mental health and well-being. Click here to watch Professor Sinead Brophy, Deputy Director at NCPHWR, talking about some of the Centre’s work around mental health and wellbeing. Read about our school networks HAPPEN and SHRN who are working to improve the health and wellbeing of pupils in Wales.